I thought this was my second quilt project, but forgot to include The Benjamin Quilt, which was technically my VERY FIRST QUILT COMPLETED! The thing with baby quilts is that I pull them together, send them off with much love, and completely forget about them. This, my third quilt top, came together MUCH more quickly than The Hex Quilt. June 9, 2010: I order a kona cotton spectrum pack and need to play with colors IMMEDIATELY! June 10, 2010: Starting to piece it all together. June 11, 2010: Continuing to piece it all together. June 11, 2010: Even I’m amazed by how quickly this happened. June 13, 2010: Finished quilt top, on display! At which point I set it aside, hoping to finish The Hex Quilt before picking it up again. 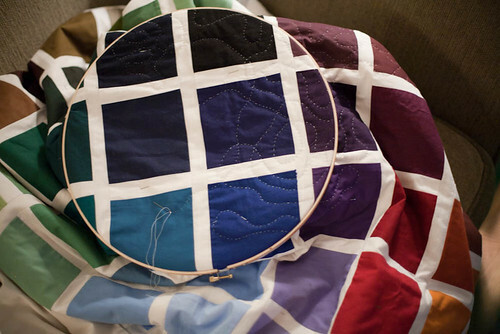 While time passed, I discovered my distaste for machine-quilting, and made a new friend who offered to teach me how to hand-quilt (in exchange, I taught her english paper piecing) – I liked the idea of incredibly random quilting lines paired with this boxy, structured arrangement of colors. 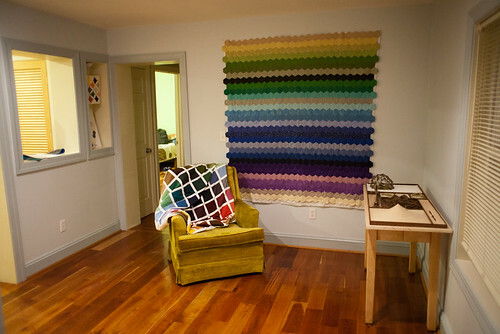 January 2011: Learning to hand-quilt. February 2012: On display at The Shuckster!